One of the most common bugs reported in Roomr is an incorrect free/busy calculation. I’ve done a lot of work over the past few months to make this more and more intelligent, handling parallel meetings, tentative meetings and multi-day meetings. Each time I submit a version, I wonder who the next incorrect report will manifest itself! To help make it easier for user’s to report this back to me, I’m adding more direct diagnostic options. In the last beta of Roomr 2.7.5, you can now report from the Favourites screen. 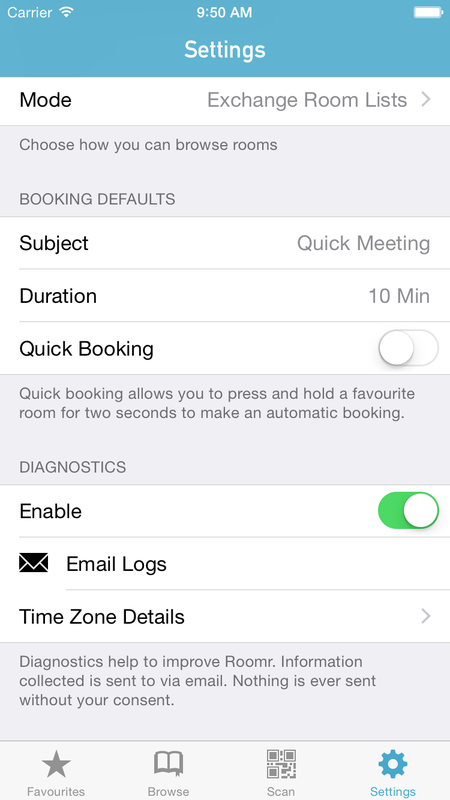 Firstly, enable Diagnostics on the settings screen. Once back on the favourites tab, identify the room that is reporting the wrong status. Just press and hold on the row for about two seconds and an option popup will appear. Press “Email Diagnostics” and you’ll be presented with a draft email containing the data returned by Microsoft Exchange. If there is any sensitive data in here you wish to remove, such as meeting subjects, you can edit this here before sending it to me. You can also add any relevant information that you think would be helpful. Using this data, I can then debug the availability calculator and find out when it’s wrong!